Not Afraid to Take on Challenges Since 1978! Aardvark MFG. Home Service & Supply has been providing premium mobile and manufactured home services to local customers since 1978. We’re here to provide you with parts, materials and ideas, to repair or improve your living space! We offer only the top name brands and take pride in our extensive knowledge of mobile and manufactured homes. 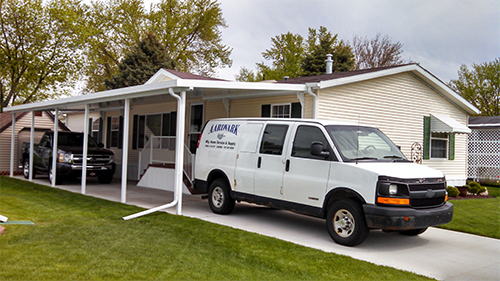 Customers know that when they need mobile home repair in Lansing, MI, there’s only one company they need to call: Aardvark MFG. Home Service & Supply. For decades, we’ve been assisting manufactured and mobile homeowners in maintaining their living spaces—from outdoor materials to indoor components, top to bottom and everywhere in between. We’re not afraid to tackle challenges and we always strive to provide reliable solutions for our customers. From the simplest bathroom fixture replacement, to a full and complete furnace retrofit, you can count on us for excellence. Our service division is always ready to assist you when you have repairs or upgrades, and we’re happy to lend our years of expertise to the job to make sure it turns out right. In addition to being your foremost authority on most mobile and manufactured home repairs and upgrades, we’re also proud to be the premier destination for mobile home parts in Lansing, MI. We have a showroom that’s chalked full of the best brand-name options for mobile home upgrades, and our store is fully-stocked with a huge selection of essential parts and components for repairs. We carry only top-name brands to ensure you’re getting the best value for your money, and our knowledgeable staff is always happy to make recommendations based on your needs. Stop by today and see our many solutions for yourself, or give us a call if you’re looking for something in particular! Our selection of products and services addresses every part of the home, including plumbing, HVAC, flooring, roofing, windows and more! We have an extensive showroom filled with examples of how we can help you improve your manufactured home! We proudly support military veterans and their families. Ask us about military and veteran incentives. We provide only the best brand-name products to our customers, to ensure optimal value. We’re ready to provide you with a free estimate on products and services when you contact us today. Whether you’re making repairs or improvements to your manufactured home, we’ve got the parts and supplies you need. Stop by our showroom or contact us today for more information! "We call on Aardvark for everything that goes wrong in our home. They have come to our rescue when our furnace went out and our hot water hea..."
""Installer, John, was right on time, very polite, efficient, explained process, reinstalled skirting, cleaned up, excellent!"" January 15, 2018 Gerald D.
"The gentleman behind the counter was very very helpful would definitely go back there again"
January 15, 2018 Paul S.
"Very friendly and helpful. Give it an A!"